"I think he gets lost a bit because he does not always put up the flashiest training times. But he's clutch. He runs well when he needs to." "Really, he wasn't in great shape (at the US Olympic Trials). He was not where you want to be. But now I really feel that he'll be that way as he hits the Olympics, that his training is leading well up to that." 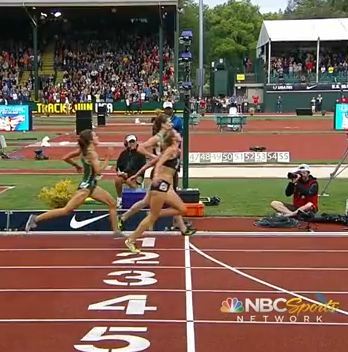 MORE IMPRESSIVE by high school female: 2:00.91 GOLD medal or 4:11.01 6th place at World Jrs? Charlie Grice High School Runner 3.57 Mile!!! LRC Mary Cain Smashes American High School 1,500m Record The 16-year-old sophomore ran 4:11.01 to smash Jordan Hasay's high school record by nearly 3 seconds to finish 6th at the World Junior Championships in Barcelona, Spain. *Day 6: Conseslus Kipruto Runs 8:06 Steeple!!!! Faith Kipyegon Runs 4:04.96 1,500! Both times were meet records. *Complete Day 6 Recap: Botswana's Nijel Amos Wins 800 By .77 Over Kenyan Olympian To Prove He's The Real Deal Olympic medal hopefuls, you'd better hope his 'injured leg' is bad as this guy is a medal threat in the Olympics if he shows up. Half of Competitors in Olympics and all Medallists Will Be Drug Tested At Olympics Let's hope they test 4th as well as some medallists will get DQd. Did UK Coach Charles van Commenee Jinx The British? Two weeks ago, he was talking about their low rate of injuries. Since then Tiffany Porter, Yamile Aldama, Greg Rutherford, and Phillips Idowu have joined Paula Radcliffe and Hannah England as people less than 100%. Liu Xiang's Coach Not Worried Xiang Pulled out of London Final With Back Discomfort "He will be sure to fight to the end in the Olympic Games." Nigerians Are Praying For Blessing Okagbare after Her Upset of Carmelita Jeter LetsRun.com is as well as we think Jeter's association with the banned Mark Block is ridiculous. It's Official: Steepler Bouabdellah Tahri Is Out of World's He was 4th at worlds last year and 3rd in 2009. 5,639-Word NY Times Front Page Sports Article On The Faith-Coached Ryan Hall Sara Hall: "The Bible is not going to tell you how to be a good runner ... I don't think Ryan is looking at the Bible for a formula, necessarily. There are certain things that God highlights for him that he applies to his training." Chicago Tribune Piece On Evan Jager Jager on the US Trials steeple final: "I have never had so much fun running in my entire life." LaShawn Merritt: "Six dollars cost me millions over a couple of years." US Shot Putter And TFAA President Adam Nelson Speaks Out On New Rule Forcing Athletes To Wear USOC Sponsored Footwear On Olympic Podium See LRC's piece on Nelson after he missed the US team here. Apparently Ezekiel Kemboi Is Still On The Kenyan Olympic Team He has left the Kenya team's training camp in Nairobi for Bristol City so he will have a "quiet and calm environment to train" ... and won't stab anybody. Blanka Vlasic Won't Compete In London Due To Injury Issues "I'm not interested in jumping below my usual level." Caster Semenya Says She Wants The Gold And WR In London A lot of confidence from someone who hasn't ran faster than 1:59 this year. She says she was motived By Nelson Mandela during her "dark days" after Berlin 2009. Aussie 400 Runner John Steffensen Claims He Was Not Selected For 400m Team Because Of Racism Was only selected for the 4 x 4. The Telegraph: "Presence Of Returning Drug Cheats Means We May Have To Suspend Disbelief At Games" Deer Russia, the first step to solving a doping problem is admitting you have one. Comrades Marathon Winner's B Sample Has Tested Positive Apparently his lawyers are angry SA broke "confidentiality" by announcing the results. Good Interview With Emma Coburn "I have 11 more months of being a collegian, and 11 years of being a professional." *5 Questions With Olympian Sheila Reid She says when she first got the call she was confused because she thought the appeal process was over. Uniform Controversy: Philip Hersh To US Congress: "Put up or shut up." "Until the U.S. government starts providing funds for Olympic athletes, as every other government in the world does, Congress has no truck telling the U.S. Olympic Committee where to get its uniforms or where they should be made." He also points out US Coast Guard shirts being made in China. Video: Tommie Smith On Black Power Salute: "That national anthem was the longest song I've ever heard." 1996 Marathon Olympian Eddy Hellebuyck Says He's Living In A Homeless Shelter Hellebuyck is a confessed doper and says his ex-wife (also former agent) stole all his savings to cover it up. What Are The Longest-Standing Track And Field World Records? Not surprisingly, you have a lot of doped up women's records from the '80s. Meb Keflezighi Thinks He Has Another PR In Him For London Says he's never been at "high mileage" for a marathoner, as he never hit 150 (highest is 136) and is usually between 115-130. Recommended Read: They Told Gunshot Victim Bryshon Nellum He May Never Walk Again, But Now He's An Olympian Coach Ron Allice: "I'm happy he's going to the Olympics. But as far as I'm concerned, he's already won." Two Stanford Stars & NCAA Champs Are Going To Olympics - But Not In Distance Events Katerina Stefanidi (wPV) and Amaechi Morton (m400H) did what Chris Derrick was unable to do - win an NCAA title and make the Olympics. A Look At Kim Conley And The Group Which Helped Fund Her Olympic Dream, The Sacramento Running Association Director John Mansoor: "The number of texts and e-mails I've gotten, suddenly everybody thinks anything's possible." Pat Tyson Talks About Steve Prefontaine And Says The Pre Movies Are Only About 50% Accurate Read the book "Pre" or watch the movie "Fire On The Track" if you want the 100% true story. Women's 100 Hurdles Highlight Toronto's National Track League Finale As It Included 5 Of 6 Canadians With "A" Standard Nikkita Holder won in 12.83. Nate Brannen easily won the 1,500m in 3:38.68. NY Times: Jeneba Tarmoh And Her Agent Still Unhappy About How Dead Heat Controversy Was Handled Tarmoh says she felt they "were puppets" and her agent complained that they had no chance to appeal initial decision since they didn't hear from USATF until later that night. We can confirm that since we were there. LRC Day-By-Day OT Coverage If you were living under a rock during the Trials, go here to catch up. Senator Furious That US Olympic Dress Uniforms Were Made In China And Says "They should ... put them in a big pile and burn them." Not to mention the competition uniforms have almost no white or blue. What's Next For DyeStat? John Dye: "It's totally up in the air at this point. ... I hope that something does come through." Recommended Read: A Peek Inside At The Top Athletes Looking for an Edge and the Scientists Trying to Stop Them Great article. 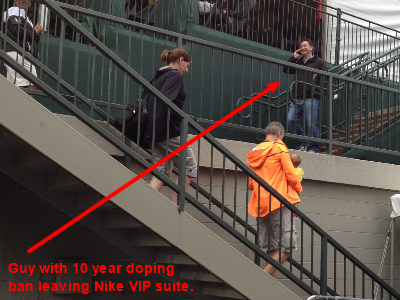 A little doping science, history, and inside stories all wrapped up into one. Do As I Say, Not As I Do: Dwain Chambers Warns Olympic Athletes Of Doping Dangers "World records can be done cleanly. I got worse on drugs. It did not help me in any capacity. It made me a very unsociable person and ruined my career and the image of the sport." Brief Chat With US Trials Steeple 3rd Placer Kyle Alcorn He finished 5 seconds ahead of 4th place, but collapsed on the track when he finished as he was all out and running scared right up until the line. USA Today Q&A With Reese Hoffa, Who Says TV Camera Angles Make Him Look As Tall As Everyone Else Even Though He's Only 5' 11" "There's a lot of time between now and then, and who knows what could potentially happen to me. I could be walking to my car and fall off the curb wrong and there goes my ankle. I'm trying to be very careful on curbs." *Q&A With Cherobon-Bawcom "To be honest, I was so sick in Eugene that I can't even pretend that I had a strategy." Good Profile On US Trials LJ Champ Brittney Reese "I can say it feels good, hearing that I'm the favorite, but [in Beijing], I was the favorite to win the bronze and I went out there and got fifth." *Crazy: After Diamond League Win, Swedish Govt. Gives 1,500 Ace Abeba Aregawi Citizenship & Files Suit With IAAF Saying She Should Represent Them, Not Ethiopia, In Olympics The article, which is based off an Ethiopian report, says Aregawi's citizenship request had been going nowhere until her sudden fame and that she wants to represent Ethiopia. Given Ethiopia's press manipulation, this should be interesting to see how it develops. LRC The Women's 5,000 Final - The Olympic Trials At Its Absolute Best This race is what the Olympic Trials are all about. The race had the American record holder in the race, it had seven women with the "A" standard in it, and it had a bunch without the "A" who dreamed of the "A" and were wiling to do the work to try to get it. At the finish, there was a surprise winner in Julie Culley and American record holder Molly Huddle finished 2nd to make her first Olympic team. But for eternity, this race will be remembered for one thing - the most thrilling of victories and the most agonizing of defeats - and by victory and defeat we mean the victory of finishing third and defeat of finishing fourth. LRC Ashton Eaton Sets WR & Mesmerizes On And Off The Track The former Oregon star was sensational and got the world record after a big PR in the 1,500 that sent the Hayward faithful into a frenzy. Afterwards, he sent the media into a frenzy with an amazing press conference. LRC If You've Got 20 Minutes, Watch This Ashton Eaton Press Conference The world record holder is cerebral and fascinating. Classy Move Of Year: Curtis Beach Lets Eaton Cross Line First As He Breaks WR - Eaton Wishes He "Could Be As Graceful" As Beach (link fixed) "I just thought it would be better for Ashton to win as he broke the world record." Olympic Champ Bryan Clay DQed In Hurdles *Clay, After Hurdles DQ: "It's The Worst Feeling Ever"
LRC Galen Rupp Puts On A Clinic As The Sub-13 Guys Punch Their Tickets To London Galen Rupp won and the three sub-13:00 guys made the team but this race held in a downpour was full of drama. Chris Derrick continued his fine 2012 in fourth. Recap, splits, results, and post-race interviews. Learn About The Greatest Clutch/Heroic Olympic Story You've Never Heard Of - Olympics retain ability to enthrall Imagine having to do a triple somersault dismount from 8 ft up on the gymnastic rings and land the dismount on a kneecap you know is broken. The result? A dislocated broken kneecap, tore ligaments in the leg, and a gold medal. 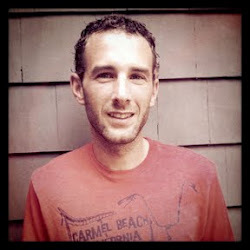 Learn About The Philosophy Of Dan Pfaff - One Of Two Coaches LetsRun.com's Wejo Has Ever Declared To Be A Genius "I believe that there is a way to do movement that's more correct than not, that's more efficient and lessens injuries... The way I see it, the further away you are from the model of excellence the more likely you are going to pay a price through inefficiency or chronic injury or inability to work as hard as your rival." Nick Willis - John Walker's 3:49.08 National Record - Is One of 3 Goals I Have Left in Track in Field The others: 1. Olympic gold 2. Sub-3:30 1,500 "I've never won a race where I haven't been in the top four coming into the bell, so if I want to have a chance of winning London I have to be in the top three or four with 400m to go." Caster Semenya Also Wants The World Record At the Olympics "It's a very simple plan – to win my first Olympic final in a world record time,"says Semenya who used to survive on £10 a week with her grandmother. Newsweek Profiles Usain Bolt: "Have the years of fast living finally caught up with the speediest man alive? " If only John Chaplin in the US was held to similar standards. 'Great Column By Eamon Sweeney: There Should be Resignations In 4 x 400 Messup in Ireland In Ireland, a slower woman was picked for the 4 x 400 team until an appeal was filed and the initial decision was over-turned. THe columnist points out the 'mistake' should never ever happened in the 1st place and people need to be give explanations or be fired. Fantastic New Documentary from Ireland - 'It's Not The Taking Part' - Follows 8 People As They Attempt To Make The OlympicsWhat if your best just isn't good enough? LRC Meet Sarah Attar - Saudi Arabia's First Female Track & Field Athlete The woman who will make history in traditional Islamic attire at the Olympics is a Pepperdine sophomore who runs in shorts during the collegiate season. She's never run an 800 in college, but that's what she'll run in London. *Philip Hersh Says Recent Gender News Isn't Quite As Good As It Seems Still needs to generate change at home. 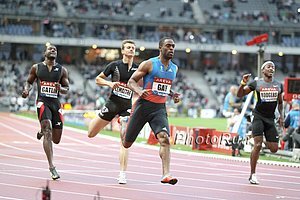 *Gaining Confidence After Paris Win, Tyson Gay Says Men's 100 "Is Open For The Games"
LRC After Two Losses At Jamaican Champs, Usain Bolt's Glen Mills Pulls Him From Monaco Diamond League Meet On July 20th Mills says at the Jamaican champs Bolt had a "slight problem" and that he's pulling track's biggest star from the Monaco meet to "give him sufficient time for treatment and time to train and prepare for the Olympic Games in London." We're not sure if the slight problem was an injury or just the losses, but Bolt says he'll be ready for the Olympics: "I will be in London to defend my titles in the 100, 200 and 4 x 100 metres." Peter Kirui Wins Peachtree As Defending Champ Sammy Kitwara Finishes 8th Kiriui won a close race over Micah Kogo and Matthew Kisorio. Bobby Mack was 13th. Mamitu Daska won the women's race. Rec. Read: Tim Layden's Final Column On The Non-Runoff After a tiny bit of help from the initial LRC interview with timer Roger Jennings that kicked this off in some ways, Layden owned this story. Another excellent, in-depth read. Three cheers for Tim Layden's coverage. Layden reveals the timer Roger Jennings has only now been overruled twice in his life. Layden has criticism for Max Siegel and Stephanie Hightower who "enacted a stunning display of non-leadership throughout the week." More General Post-Trials: A Look At First-Time Olympians, Including 32-Year-Old Carmelita Jeter USA Today "Historically, most people weren't able to go to a second or third Games because they had to put food on the table." Down Goes Bolt #2: Blake 19.80 Over Bolt 19.83 Bolt had the lead in this one and ran horribly the last 100. Video here. *Bolt: "It is not like I was blown away. I know what I need to do to get it right." On The Boards: BOLT IS DONE!!!! 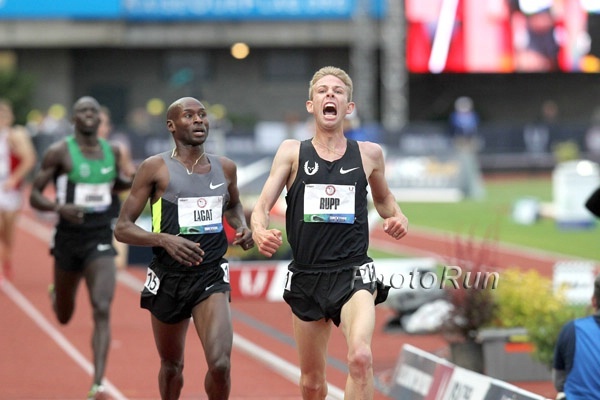 M 5,000: LRC Lucky 13 - Galen Rupp Snaps Winless Streak In Style - 52.54 Last Lap Beats Bernard Lagat & Steve Prefontaine's Meet Record Galen Rupp entered the Olympic Trials 0 for 12 against Bernard Lagat during his lifetime but he left 1 for 13 and boy was it impressive. Not only did he win, but Rupp let it came down to the last 400 and then outkicked the 2nd-fastest man ever at 1,500. His last 400 was faster than what won Mo Farah World Championships gold last year. 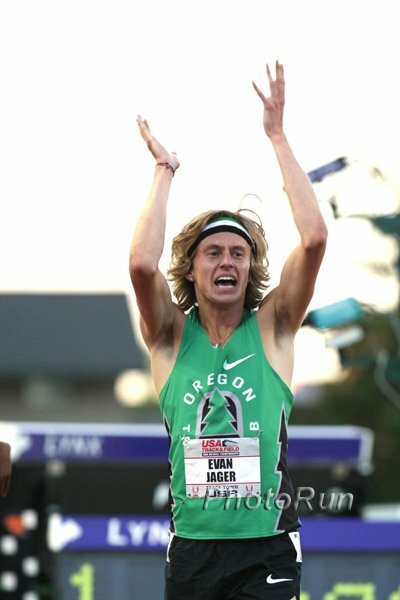 M Steeple: LRC Evan Jager Wins With Ease As Three First-Time Olympians Punch Their Tickets To London Jager, Cabral, Alcorn. And a very happy 4th placer - former 4:22 HSer Donald Cowart. 400: University Of Illinois' NCAA Champ Ashley Spencer Skipped The Trials To Focus On World Juniors With a 50.95 PR, she had a decent shot at making the team (at least on the relay). Young athletes all assume they'll have more chances 4 years from now, but with injuries it doesn't always work out. But if you make it, then "Once you're an Olympian you're always an Olympian." Webb Speaks: Alan Webb On His Past Brilliance: "I sometimes wonder how I did it myself." "Maybe I inspired everybody too much, like I created a monster, and now I have to run against these guys." 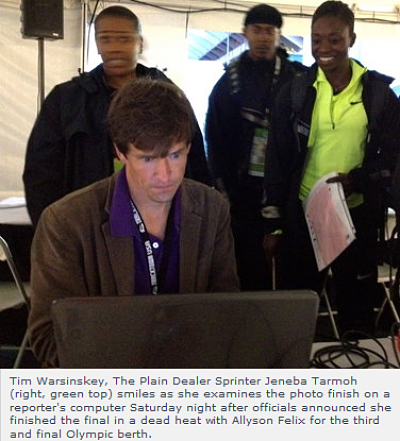 LRC The Inside Story Of How Jeneba Tarmoh First Saw The 100m Finish Photo On The LetsRun.com Laptop Roughly 3 Hours After The Race Carmelita Jeter won the 100m, but the story was the battle for the third spot between training partners Jeneba Tarmoh and Allyson Felix. At first, Tarmoh was announced in third by .001 but then after the stands had emptied, a dead heat was announced. We thought we were the only ones not knowing what was going on, until next thing we knew Tarmoh was looking at the finish photo on Wejo's laptop (pic on right). LRC An Exclusive Interview With The Man Responsible For Reading The Allyson Felix 100m Finish Picture LetsRun.com exclusively caught up Roger Jennings, the man whose job it is to determine who finished third and who got fourth, and the timing whiz explained how it was determined there was a dead heat. Plus we do a little bit of research and determine that even though USATF has said there is no protocol for breaking a tie, that the USATF rule book does in fact envision such a scenario and has a solution - an old-fashioned drawing of lots!!! LRC Lolo Jones' Third Place Steals The Show In The Olympic Trials Hurdles Final Lolo turned around her season in 24 hours after a "reality meltdown" following round one. She said, "I woke up today and did not think I would make the team. I was fighting a constant head battle to get through this. I had my sports psychologist on speed dial 1, my pastor on speed dial 2, and my mom on speed dial 3 ..."
LRC Day 2: Nick Willis Goes For It, The American Mid-D Men Struggle & Molly Beckwith Pulls Upset On Day Full Of Upsets Day 2 was full of a lot of upsets, particularly on the women's side, as Carmelita Jeter, Shelly-Ann Fraser-Pryce, Sally Pearson, Janeth Jepskosgei, Amantle Montsho and others were upset. The highlight from a LetsRun.com standpoint was wacky men's mile, where Nick Willis had a 3.5-second lead at the bell. It wasn't a good day for Bernard Lagat, an awful day for Leo Manzano, and a day to be remembered for Molly Beckwith, who suffered heartbreak at the US Trials. 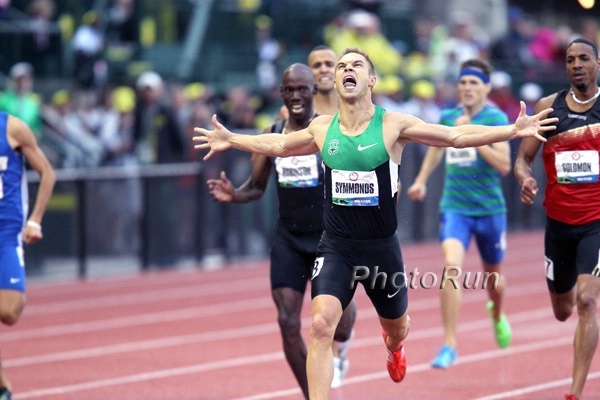 But the American who had the best day may have been Nick Symmonds - and he didn't even run. LRC Day 1: Mo Farah, Vivian Cheruiyot Win With Ease As Maryam Jamal Shocks Women's 1,500 Field Mo Farah beat a week field that included training partner Dathan Ritzenhein, the American 1,500m women did not impress, Vivian Cheruiyot kept it going, and Aries Merritt stepped up again, as Tyson Gay came from behind to win. MB: *What an awesome Mile *Charlie Grice High School Runner 3.57 Mile!!! *Leo Blows Up and Finishes in 4:00 at London DL *Centrowitz racing 800m in London DL, predictions? *Today's mile in London proves Alan Webb's AR was no joke *"One can't say this was anything but a disaster for Lagat and Manzano." Nick Willis: "I'm still fit because to be able to do that and not die ridiculously is a good sign." He said the last time he did something like that, he ran 4:08. From The Man Who Said He Wasn't Injured: Phillips Idowu Pulls Out With Hip Injury This is the 4th straight competition he's pulled out of at the last minute. TJer Yamilé Aldama Speaks Out Against "Plastic Brit" Jibe Which Is Starting To Offend Her She finished 3rd after coming back from a shoulder injury. Those Closest To Mo Farah Talk About His Transformation From "Daft Kid With A Dyed Blond Afro To Mature Family Man And World Champ"
Tyson Gay Wins 100 In 10.03 US Trials 3rd placer Ryan Bailey was 2nd. MB: Nick Symmonds Barred From London DL According to his Twitter account, meet director Ian Stewart said he was a "liability." Robbie Grabarz Says The Turning Point In His Career/Life Was Last Year When His Coach Cussed Him Out "He told me my attitude was s---. Don't waste my f------ time. Why are you bothering? Go away, ask yourself." He responded by PRing by 8cm this year to be ranked #2 in the world. JavierCulson Beats Dai Greene 47.78 To 48.10 Looking ahead, Greene says three rounds at the Olympics is very different than a "one-off event" like the DL. Complete Day 6 Recap: Botswana's Nijel Amos Wins 800 By .77 Over Kenyan Olympian To Prove He's The Real Deal Olympic medal hopefuls, you'd better hope his 'injured leg' is bad as this guy is a medal threat in the Olympics if he shows up. Run-Off: US Women's 4 X 4 Will Be In A Run-Off Today To Try To Make The Final They won the semifinals, but were DQed for a exchange zone violation. An appeal ruled official's error; now they have to re-run the race to post a legal qualifying time to make the final. 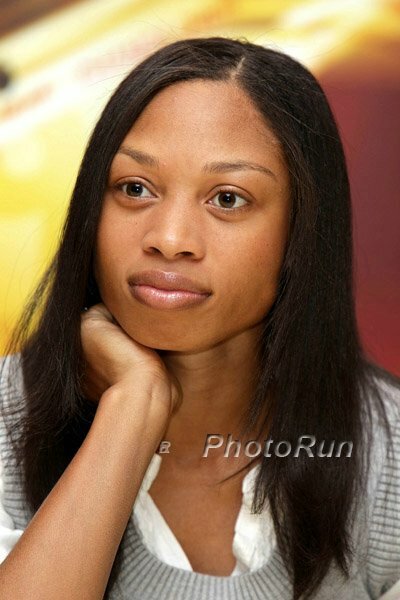 Jamaican Analysis Of Olympic 200: Will Allyson Felix Finally Get Gold Or Her Third Straight Silver? No Kidding: Michael Phelps And Usain Bolt Won't Be As Dominant In London As They Were In Beijing This article talks about how people have caught up to Bolt, but that isn't true at all. He's just slowed down. We think Sam Chelanga still has a good chance to win $100,000 despite being crushed by nearly a minute. King David Rudisha Runs 1:42.12 Altitude WR To Put Kenyan Crowd Into A Frenzy King David wasn't the only one to excite the crowd as even bigger cheers went to Ezekiel Kemboi, who set the crowd afire when he pulled up to eventual steeple winner Brimin Kipruto and seemingly motioned to let him win with 50m to go before re-enacting his famous "Daegu jig" at the finish. Asbel Kiprop barely qualified (3rd) as Olympic champ Nancy Lagat, Linet Masai and Paul Kipsiele Koech fell by the wayside. *MB: Rudisha's 1:42.12 NEW ALTITUDE WR!!! 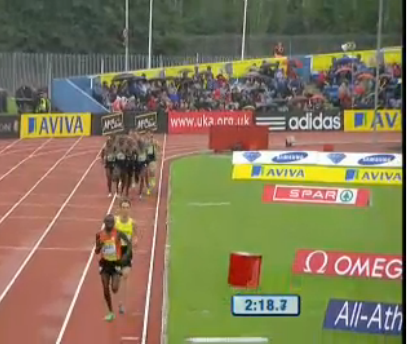 Brimin Kipruto 8:11 steeplechase and Isaiah Koech 13:09 as well, if this isn't a troll. *MB: Kiprop 3rd: "It's a good thing that I did not win the Trials since the pressure that comes with it is too much." LRC Redefine Running: Who's In Charge Of "The Sport" (link fixed) Last week Matt Taylor, the guy behind ChasingTradition, ChasingKimbia, ChasingGlory, and an upcoming Usain Bolt video game, told you running was dying. This week he tells you it's thriving. He explains the inconsistency. While the activity of running is thriving, the sport is dead with the mainstream sports fan. In the internet era, diehards get their fix, while Joe Sports-Fan has no idea who Matt Centrowitz is. How do we fix this?